Brad Paisley may have posted a photo of himself stark naked from his diaper days on Twitter recently, but baring it all as an adult is something the country hunk will never do. During an interview on Broadway's Electric Barnyard radio show recently, when asked if he would ever do Playgirl like Keith Urban, who posed in 2001, Brad say he has been asked, but declined. "I've actually turned that down," the singer said. "They've asked a few times. They can forget it." While Brad may be cute, he said they didn't come to him for his looks. 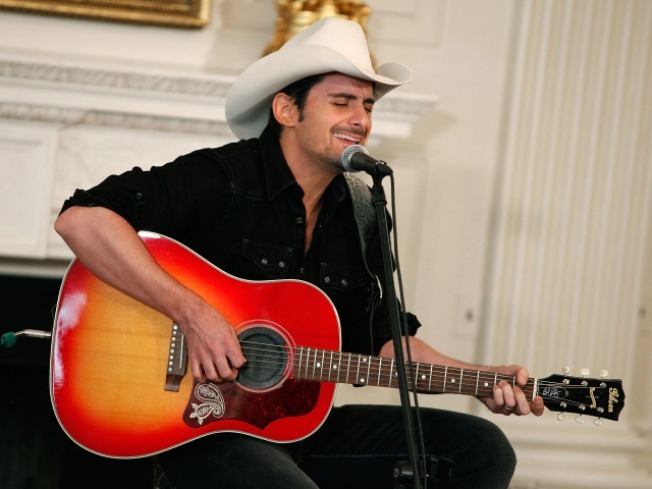 "They ask every male country singer, trust me," he said. One reason why Brad won't be baring it all — or posing with just a strategically placed guitar — is because he wants to be someone his younger fans can count on. "That's just not what I'm about," he said. "You know another thing? I've got a lot of fans that are teenage girls here and there and I don't want them buying that magazine. I'm not going to promote that magazine." In fact, Playgirl recently stopped publishing and now produces content online only, but Brad still won't be joining the fold. "Some things are better left to the imagination and that's one of them," he added.